As you can see everything is related. anyway as I said in my spanish site. I didnt go the mole, it seems it was cool but I dont have the time to go there Im doing a lot of special projects behind the scenes that will help the comic a lot. in nerd news spring break is coming and I live 100 mtrs away from the beach so I working a lot to have a couple of free days. This entry was posted on Wednesday, March 27th, 2013 at 2:22 am and is filed under Uncategorized. You can follow any responses to this entry through the RSS 2.0 feed. You can leave a response, or trackback from your own site. 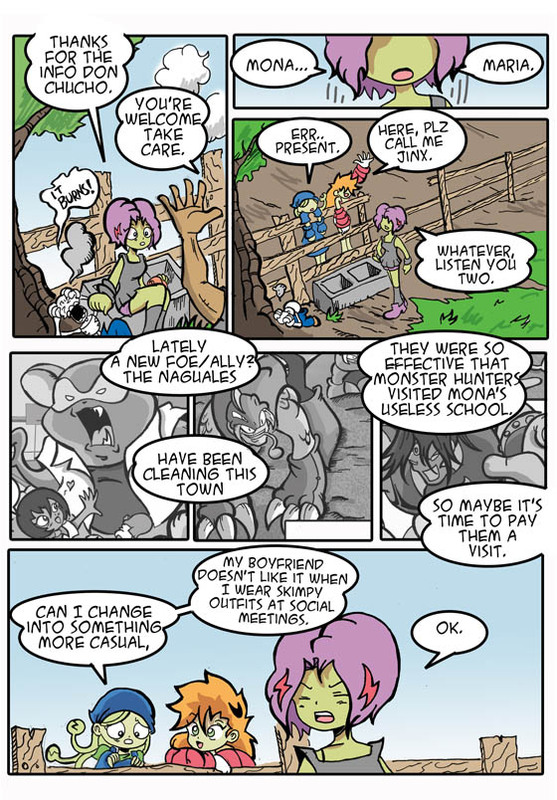 In the last panel, in the second bubble there is a spelling/grammar error. I like Jinx’s expression in the last panel. She looks so interested. I am enjoying this story..